Mother’s Day – It’s Everyday…. When I sat on my couch thinking what should I write about my mother.. A question hit my mind. The question is Will I ever be able to write a great story or an epic which could be sweeter than the word “Mother”? Yes, the word “Mother” itself is a great epic which no other could ever beat. As I could not write a story, I thought of singing a raga for her.. Again another question.. This time it is, Can I sing a better swara (music note) than the swara “Mother”? Isn’t it the Mother, who is the supreme swara for the song of my Soul? While struggling about where to start and what to write.. The frame of the Almighty on my wall drew my attention. This time it’s a flow of questions and theories… Whether it is Lord Ganesha for the Hindus, or the Jesus for Christians, they too have their mothers. Even though they are Gods, they too were born by sharing an umbilical cord with their mothers. It is only a mother who can give birth to anyone. Doesn’t this mean that “Even a God must have been born from a mother’s Womb”? Then “a Mother who can only give birth to a God or to any other great mother, is THE GREATEST OF ALL”? I think my quest is over. Finally, I found out what I should write.. I should write thanking my mom for everything.. Bringing me into this world by sharing your blood and flesh.. Teaching me to rise by holding my fingers.. Guiding me to walk in the right path always by correcting my wrong steps..
Searching me when you don’t hear me.. Wiping off my tears, when I cry..
Soothing me when I was in discomfort.. Helping me to find myself, when I was lost.. Blessing me to live for an eternity by saying “God Bless U”..
It’s U my dear mom.. It’s U.. Without U, there is no I..
U r my mornings.. U r my evenings..
U r my dusk.. U r my dawn..
U r my success.. U r my defeat. U r my happiness.. U r my sorrow..
U r my best pal.. U r my best critique..
U r my strength.. U r my weakness..
U r my breath.. U r my expression..
U r the happiness of my heart and mind.. I once again wish all the mothers A VERY HAPPY MOTHER’S DAY..
Admiring the greatest potential of one of the verses from Taittiriya Upanishad which conquers Respects to Mother, Father, Guru and Guest as they are all forms of God! These primary roles of life are the most important to any clay that is getting molded along the journey. It is of relative nature and not absolute that who plays what in each of our lives. Yes, it is not absolute and cannot be equated to everyone. But the four roles keep popping up as we travel. Some travel along, some wrap up once their destination is reached, possibly before us or even after, which is beyond science to detail. A Mother dedicates her everything to express and bind the family with the extra love and care that everyone at home and surrounding her feels important and special. A Father proves to be the power house of motivation to step up and stay strong at all occasions. A Guru shows the path that is beautifully carved to take us not just through a journey that is beyond materials and pleasure, it is for generations to be built morally strong. A Guest shows us the form of God driving us to stay calm and patient enough to tackle through whenever arrived. On the whole, the package of these 4 roles could be played by anyone in all of our lives, but is played, in many cases, very well enacted! The “Adi Para Shakthi” that represents the Sattva Guna and consort of Lord Brahma is the goddess of wisdom, creation, learning, compassion, peace, art and much more. With me and out of the three women that I was blessed with to color the canvas of my life, my MOM becomes the Adi Para Shakthi! This woman I flavor was born in a small village called “Boningi” near the town of “Srirangavarapu Kota (S.Kota) of ViziaNagaram district of Andhra Pradesh. The blessed parents were Shri. Venkata Rao Inaparthi (Veeravasaram in West Godavari district) and Smt. SarojiniKoti from Mulaparru (West Godavari, Andhra Pradesh). Connected much to her father (like all daughters of course), she has been the youngest of all four siblings. Siblings getting offers those days to move to maternal or paternal grandparents place for education being common, my mom and elder aunt stayed back with their parents. Mom’s father (my grandfather) was a Village Development Officer serving for the state with high moral values and discipline that took an appropriate post to serve the people. Being a Marxist and Socialist, he had always thought about and for people and their welfare is utmost importance. He received the title of “Guruvu Garu” in all hearts. Mom’s mother (my grandmother) hailing from a traditional family of values carried with her the pillar of support to supplement Granpa’s thoughts. She has been a complete and thorough home maker that Grandpa never had the slightest worry of the house when at work and even back home! A true role model to my Mom! Balancing her boat with the respect that her father has earned through his living and the love that mom has inculcated, my mom relished the values through her upbringing. Values and Ethics were her nerves. Her childhood memories have always kept me envious though she has given me better than the best always and is still thriving to. My mom had excelled in her studies though she continued in the village itself and also gained equal interest and passion in extracurricular activities. 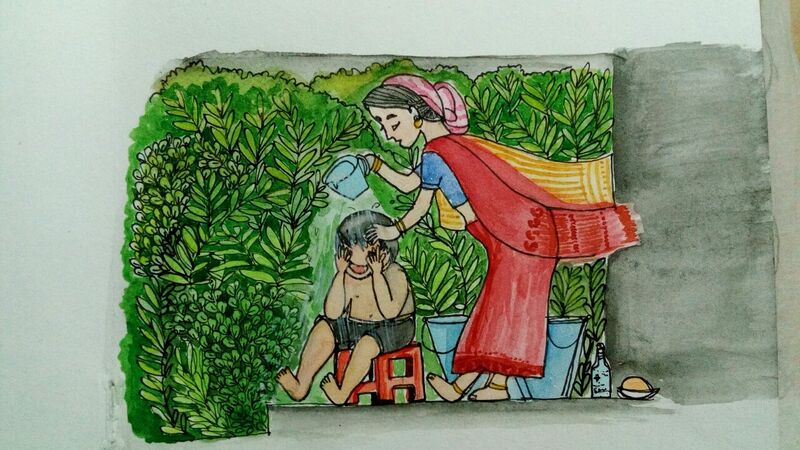 The childhood pranks being the vitamin for the rest of the life, my mom treasures the stolen mangoes from her Uncle’ orchards, building mud castles and houses, bunking classes with truth quoted justification, tasting a delicious secretive jaggery and many others that remains fresh as discussed or revisited. Good is always to be balanced, not necessariy with the bad, has been my point from the start. Will see what life had poured and blessed my mom with and how it took a turn!